Occasionally someone writes me with a question about woodworking. Sometimes I'm able to give them an answer and other times I enlist the help of others to provide a better and more thorough one. A 31-year old woman from North Carolina would like to get into woodworking, but "knows absolutely nothing." She asked if I could suggest some ultra-basic beginner books and resources. She has an inkling that she'd like to make furniture, but as she's just getting started, she's not really sure. 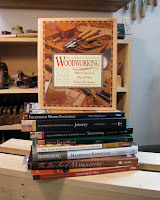 The book that changed my life nearly two decades ago is The Complete Manual of Woodworking by Albert Jackson, David Day, and Simon Jennings. It was the perfect place to start for someone who didn't know the difference between a router and a bandsaw. 1. Foolproof Wood Finishing by Teri Masaschi. Many will disagree with me about the best finishing book, and indeed, I haven't seen Marc Spagnuolo's soon-to-be-released book, but of the ones I own, this one is the most cut-and-dried and clear to me. 2. The Complete Illustrated Guide to Joinery by Gary Rogowski. Gary covers all of the most commonly used joints—how to cut them with hand tools or power tools. No question about sharpening is left unanswered. Lie-Nielsen is a master sharpener. Bütz addresses all types of carving, starting with whittling. I do not subscribe to his lettercarving or chip carving techniques, but for relief carving and others, this book is a good start for beginners. Hands down, this is the very best book on chip carving. Absolutely everything you need to know in order to work with handplanes. This book is the definitive guide. This book is fantastic. Marquetry is well within your reach with Stevens' guidance. Again, all guesswork is removed with this book. Benson is an expert on the subject. 9. Roy Underhill's books are perfect if you plan to pursue traditional woodworking. 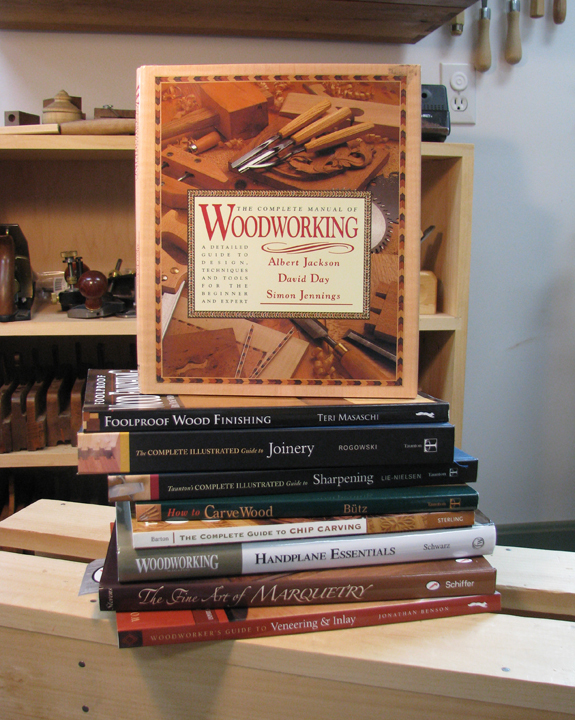 I have no books on woodturning and very few on building furniture, so I'm not able to offer advice on those topics. However, if you are looking for some simple plans geared toward beginners, I encourage you peruse the I Can Do That page on Popular Woodworking's site for free downloadable plans and articles. For more online help, I suggested she visit woodworking forums, blogs and podcasts—invaluable resources. There are lots of great books and magazines for beginners. Help a lady out and post your thoughts in the comments. And feel free to contest any of my recommendations. They are just my opinion and open to debate.